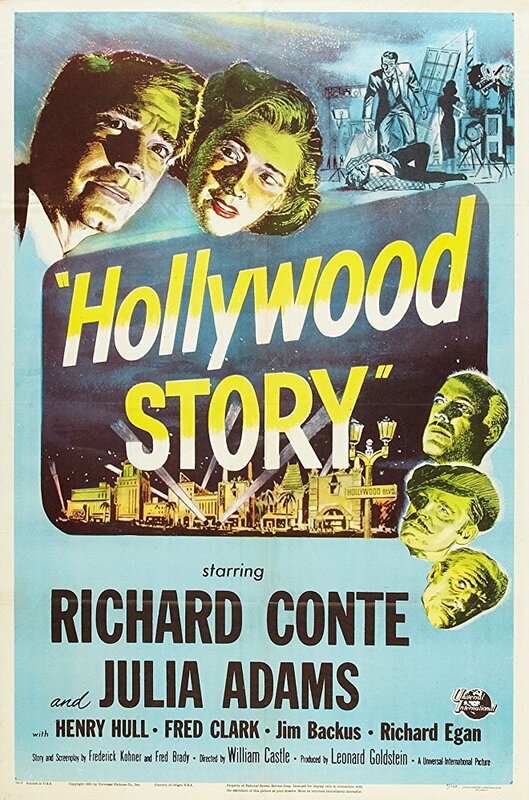 HOLLYWOOD STORY (1951) is a nifty little murder mystery set against the backdrop of, you guessed it, Hollywood. 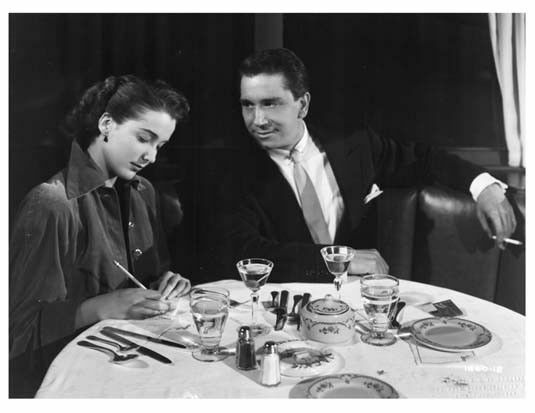 Richard Conte plays Larry O'Brien, a film producer newly arrived in Los Angeles. He renews old acquaintances, including agent Mitch Davis (Jim Backus) and financial manager and partner Sam Collyer (Fred Clark). A visit to an empty studio available for rent also leads O'Brien to a story idea, solving the murder of silent film director Franklin Ferrara. O'Brien also meets a police detective (Richard Egan) and the daughter (Julie Adams) of a silent film actress as he simultaneously works to untangle the mystery and put together a production based on the incident. The story itself is somewhat flat, akin to a run-of-the-mill TV murder mystery, with Conte's O'Brien an unemotional placeholder character. I love Conte and Adams but neither of them have any depth here, they're just saying lines. What makes the movie a whole lot of fun, though, is the setting. It might be more of a thrill for a Southern Californian like myself who knows the area, but what a fun tour of Hollywood as it looked smack dab in the middle of the 20th Century! A poolside breakfast scene at the Hollywood Roosevelt Hotel was particularly fun, since I'm there for every TCM Classic Film Festival, but the sights also include the Universal Studios lot, Chaplin Studios on La Brea, Jack's at the Beach in Santa Monica, and the Hollywood Christmas parade. A few old-time movie stars have cameos, but for me the best fun was when Joel McCrea walked out of a trailer and proceeded to shoot a scene with one of the characters in the movie. As a huge McCrea fan, it doesn't get any better than that! The film, scripted by Frederick Kohner and Fred Brady, winds to a close in a quick 77 minutes. The movie was directed by William Castle and shot in black and white by Carl Guthrie. HOLLYWOOD STORY has been shown at Southern California film noir festivals in the past but I doubt this Universal Pictures film has been on TV for years. It's available on DVD from the TCM Vault Collection as a single title or in the Dark Crimes: Film Noir Thrillers Vol. 2 collection. I recently reviewed UNDERTOW (1949) which is also part of the Dark Crimes Vol. 2 collection. Last year Caftan Woman also wrote about HOLLYWOOD STORY; her post highlights some of the silent era actors who have cameos in the film. Or should I say "picture"? One of the charming things I've noticed in several movies of late is the way they all refer not to making movies or films, but "pictures"! Thanks for sharing, and for your perspective on this fun little picture for fans like us with an appreciation for the history of the craft. Love Conte and Egan in this, and wish they'd have teamed up to solve more, and perhaps more exciting, Hollywood mysteries. I’m glad to hear you enjoyed it and that your reason mirrors my interest in seeing it. I love seeing how Old Hollywood depicted itself and then comparing it to what I saw during my own visit last August. This cold have been a pretty good picture, but it isn't, and for all the reasons in your review. Julie Adams is always more than capable, but far from mesmerizing. And you can say the same thing about Bill Castle's work which seems to be dominated esthetically by the ad campaign. So, he may be an auteur, but why would one care, and if you do, is it just your heart reaching out to a nice guy under achiever. The best part of Hollywood story lies not n its achievement, but what it might have been. A fun derivative variation on Sunset Boulevard. With a really interesting group of 'waxworks.' As for Richard Conte, some old time stars are spoken of as underrated. None were, that is why they were stars, but Conte, in my view, is almost always overrated. I believe Robert Evans summed him up this way, or along these lines. If Nick Conte could have harnessed on screen what he projected off, or in life, he would probably have been at the top of the heap. Not a verbatim quote. Thanks to you all for your thoughts! Caftan Woman, it would have been great if there had been a Hollywood mystery series -- though, as you say, maybe a little more exciting! Seth, from the standpoint of peeks at Old Hollywood you will probably enjoy it! Barrylane, I really like Conte and Adams in other films, this one just didn't give them much to work with -- and Julie was so young! Looks like it's one of a couple films bridging the gap between her "B" Western days and more substantive films like BEND OF THE RIVER. Thought Conte was really terrific in films like HOUSE OF STRANGERS and CRY OF THE CITY. This one, he's just going through the motions. Rather interesting to hear that he was perceived to have such a "big" personality offscreen! I had the pleasure of seeing a double bill of "Hollywood Story" with "Undertow" at the Egyptian Theatre Noir festival eight years ago; this little picture has stayed in the memory, partly because Julie Adams spoke after the film and also because I live near the Chaplin Studio, which is wonderfully unchanged in appearance since the Little Tramp filmed there. And there was a big laugh for Jim Backus' line, "Who would kill an agent?" It was nifty that some audience members clapped at the silent film-star cameos, especially for Francis X. Bushman; also Betty Blythe had a brief scene, and L.A. filmgoers had a chance to see her in her prime at the recent UCLA screening of the 1927 "A Million Bid". Thank you so much for sharing your memories of seeing HOLLYWOOD STORY and UNDERTOW at the Egyptian, Stefano! Really wish I'd been there for that -- though I've been fortunate to see Julie on other occasions. :) Sounds like it was a great evening!! Regarding the term "pictures", Laura, it's an interesting observation but I haven't been conscious of it although I have probably seen it a few times. Other terms, of course, are moving pictures (passé), "motion pictures" (mostly used by the studios in the 1950s), simply "the product" and "features" (also studio terms), the slang "flicks" or "flix", and photoplays (sometimes seen in the old fan magazines). Also of interest is the British corruption "fillums" and the South African "scopes" (cinemas there were often called "bioscopes"). Jane, what fun Joel regularly used the term "pictures." I'm delighted I could point you in the direction of this film, you will really enjoy Joel's substantive cameo along with the great shots of "mid century" L.A. Enjoy!! Laura, I enjoyed the article about HOLLYWOOD STORY(1951). I can't remember if I have ever see this one. I don't really have any memory of it. I think Billy Wilder may have set in motion the idea of using former silent movie stars in cameos with his SUNSET BOULEVARD(1950). Pictures and Picture shows. My parents and grandparents would say, "Go to the pictures, or to the picture show." Larry Mcmurtry's novel THE LAST PICTURE SHOW(1966) was set in 1954 Texas, as was the movie, which was released in 1971. Director John Ford used the term pictures, as well. I've always used the terms movies or films. Thanks for letting me know you enjoyed it, Walter! It would definitely make sense that some of the inspiration for this could have been SUNSET BOULEVARD. I've always heard the term pictures, of course, but the usage has been really pronounced in several recent movies. Now I'm alert to it everywhere! It's quite fun to think about who used what terminology and when. (Love that Ford said "pictures.") Like you I always say movies or films. Hope you'll enjoy visiting here again!